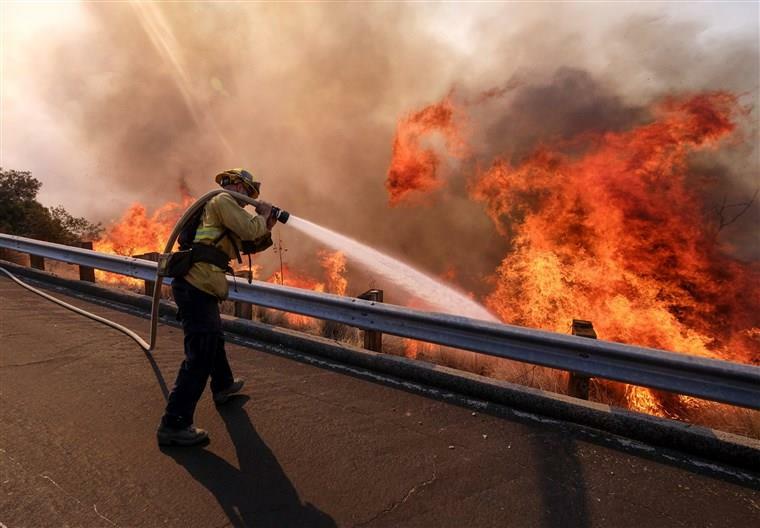 SAN FRANCISCO, Nov. 12 (Xinhua) -- The U.S. northwest state of Alaska has sent half a dozen fire personnel to California to aid in its fight against raging wildfires that have killed at least 29 people, the KTUU TV outlet said Monday. The fire personnel were dispatched to California over the weekend upon a California request on Friday, KTUU quoted Tim Mowry, an information officer for the Alaska Division of Forestry, as saying. "The first people left Saturday to fill various roles (in) management positions," Mowry said. California had initially reached out for help from nearby regions, but the deteriorating wildfires in the state forced it to search for fire reinforcement in more distant states including Alaska, according to the report of KTUU licensed to Anchorage, Alaska. Californian authorities said the massive wildfires in its northern part had pushed the death toll to a record 29 after six more bodies were recovered from the fire-raged area on Sunday. The casualties have already matched the Griffith Park Fire in October 1933, which is the Golden State's deadliest fire so far, said the California Department of Forestry and Fire Protection. The Northern California fires have scorched over 111,000 acres (about 449 square km) and destroyed 6,713 structures, including 6,453 homes and 260 business buildings.